Are Magnolias Right for my Garden? Magnolias can be evergreen or deciduous but the deciduous varieties (loose their leaves in winter) are far more common in the UK. The reason is that they produce flowers when they have few leaves and this allows the beauty of the flowers to be seen much more clearly. They are one of the oldest plant groups still in existence today and date back at least 20 million years with some related plants dating back 95 million years. Magnolias evolved well before bees did and evolution has formed them so that they encourage pollination by beetles and not bees or moths. This greatly increases their chance of successful pollination. Bees do visit them but normally too late in the year for successful pollination. The cultivation of magnolias in gardens dates back at least to 600 AD, records showing that they were popular in large Chinese gardens. Magnolias are named after the French botanist Pierre Magnol although the original plant which took his name was not in fact a magnolia. It was William Sherard who correctly attributed the name to the magnolia species. Use the checklist below to work out if a magnolia is suited to your garden. They prefer full sun throughout the year but will also grow well in light shade for part of the day. In low light conditions the plant may not produce flowers. Some varieties are well suited to growing in containers. Different varieties range from a height 2.5m / 8ft and spread 2.5m / 8ft up to 20m /63ft height and spread. Choose your variety according to the space you have. They grow best in soil which is slightly acidic or neutral, they do not do well in alkaline, chalky soils. See here for more information about acid and alkaline soil. They are shallow rooting plants and because of this the soil should not be allowed to dry out. An annual mulch is highly recommended to prevent water loss. Magnolias tolerate neglect well (aside form an annual mulch) when they are established because their nutrient requirements are low and they grow well with minimal pruning. All produce flowers and the most common ones do this for a couple of weeks (depending greatly on local weather conditions) in late March to late May. They should not be planted in frost pockets or areas that are subject to water-logging. They need to be planted in a fairly protected position. Wind will not only exaggerate the effect of frost but can also damage the branches. Magnolia 'Elizabeth' - height 10m / 32ft, spread 6m / 19ft. Magnolia loebneri - height 8m / 25ft, spread 6m / 20ft. Magnolia soulangeana - height 7m / 22ft, spread 7m / 22ft. Magnolia stellata - height 2.5m / 8ft, spread 2.5m / 8ft. 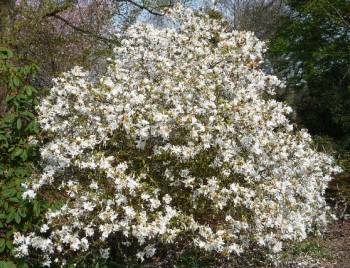 Magnolia 'Susan' - height 3m / 10ft, spread 3m / 10ft. The best time to plant a deciduous (looses its leaves in winter) magnolia is when they are dormant, from December to January. Dig the soil well slightly deeper than the container of the new plant and 60cm to 90cm wide. Remove the plant from the container and place the plant in the hole to the same depth it was in the pot and fill in around it with the dug earth. Do not pile the soil higher around the base of the plant, the roots of magnolias are shallow by nature. Water well and make sure the area around the plant remains moist for the next nine months until the roots have established themselves. An annual mulch with well-rotted organic matter such as the compost heap or spent potting compost. Weed well around the base of the plant and keep mulches away from the stem. If your garden soil gets dry in summer water very well a couple of times during the dry period. Magnolia roots are shallow and even well-established they can dry out in summer. Pruning a magnolia will not damage it but it will encourage the growth of wispy shoots which detract from the shape of the plant. Pruning can also cause flowering to reduce for a couple of years. So, the rule with magnolias is to avoid pruning them unless they are outgrowing their existing space. The best time to prune a magnolia is early to mid summer because this will avoid the cuts bleeding which can be an easy site for infection. Some Magnolias will grow very well in large containers and our advice is to choose varieties of Magnolia stellata. They are naturally smaller compared to other magnolias and the container will restrict their size even more. Stone or terracotta are best for a couple of reasons. First and most importantly, their weight (compared to lighter containers) will help prevent them from being blown over in strong winds. Choose containers with a base that is wide enough to stand well. Wood containers look very attractive and they also have substantial weight. However they may well require treatment to prevent the wood from decaying and the treatment may damage your Magnolia. Make sure any container you use has good drainage holes in the base. Avoid bulbous, rounded pots where the top is narrower than the middle or base because when the time does come for re-potting the only way to remove your Magnolia will be by breaking the container. The size of pot should be appropriate for the size of the bush. Simply looking at the pot size in relationship to the tree size is normally enough to allow selection of the correct size of container. However, as an example a 45cm (18in) square pot supports our 140cm high magnolia very well. When you buy your Magnolia it may require immediate re-planting or after several years it may outgrow the existing container. The best time of year to re-plant a Magnolia tree is in late winter to early spring. First select a new container as described above. The next decision is which soil to use. Magnolias prefer a slightly acidic soil so potting compost for Rhododendrons, Azaleas or ericaceous plants is suitable. Another solution is to use a loam based compost which is slightly acidic. John Innes sell their own ericaceous mix which is an ideal choice especially if about 20% of sharp (not builders) sand is mixed in. If the container has previously been used then scrub it clean of all the old soil residue. Add about 4cm (1½in) of smallish stones / broken pot pieces into the base of the container - this will help to ensure good drainage. Remove the tree from its old container and lightly brush away some of the compost from the root ball and the surface. Be careful not not to damage the roots because they can easily break. Add some new compost into the container and then transfer the magnolia onto the compost. It will be necessary to add or remove some compost to ensure that when more compost is added it comes to the same level around the main stem as it was in the old container. Add new compost, a few centimetres depth at a time, and lightly firm it down. Don't compact the new compost but do ensure there are no air-pockets in it. Fill up with compost to about 5cm / 2in from the top of the container. Add about 2cm / ¾in of chippings to the surface of the compost. It is well worth buying a bag of chippings which finishes off the surface nicely as well as deterring weeds and pests. Water well with rain water (rather than tap water) if possible. It is also a good idea to buy container supports which will keep it off the ground. This ensures the best possible drainage and stops the base of the container becoming a home for all manner of insects and bugs. Magnolias growing in containers need only minimal care but they do appreciate it frequently. The first rule is to try and maintain a constant supply of water in the compost without over-watering. Even two or three days of warm, sunny weather without watering can do them a lot of harm. If you plan a holiday in the summer the ideal is to ask your neighbour or friends to water your Magnolia(s). If that is not possible then move them into a shaded and cool position. If your area suffers cold winters and or high winds then place your Magnolia in a cool greenhouse or garage from late December onwards and bring them back into the garden in early Spring. Feeding with a general purpose fertiliser can commence from early May at fortnightly intervals. Cease feeding in late July so that the tree has a chance to 'harden up' before winter. An annual prune in early June should remove any damaged or wispy stems particularly in the centre of the tree. Pruning can also be done to maintain the shape and size of a Magnolia. 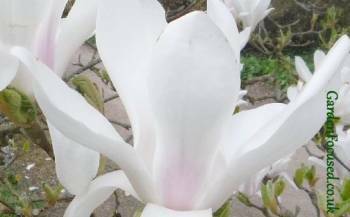 There are two principal considerations when looking after Magnolias in containers during the UK winter. The first is to prevent the soil from becoming water-logged by winter rain. As mentioned above, Magnolias are tolerant of many conditions but they do not appreciate large changes in the amount of water in a container. The second factor to watch out for, as with all containerised plants, is to avoid the soil freezing over long periods of time. Magnolias have a fleshy root system which is easily damaged by protracted periods of frost. It is possible to insulate the containers but this only delays the frost and when warmer weather appears, an insulated container takes longer to defrost. With the above two principals in mind our advice is to move your Magnolia into a more protected position during periods of frost in the winter. The ideal position would be in a cold greenhouse. This will protect your tree from the cooling winds and give some protection from frost. If you do this though, be sure to remove it from the greenhouse at the first sign of warm weather - greenhouses can become surprisingly hot very quickly in only moderately warm weather. Most of us don't have greenhouses however so a good alternative is against the exterior wall of a house. As with greenhouses, move the tree back into the open after the frosts have passed. If you have neither a a greenhouse nor an open garage then do not be tempted to move the tree inside the house. Conditions there will too warm and the air too dry. The best option is to search out the most protected position near the walls of the house. House walls will be relatively warm in winter and can protect your Magnolia tree from the worst of the frost. Also look for a position which protects from wind and reduces the amount of rain that falls on the soil in the container. Younger magnolias can be attacked by slugs which eat the more tender leaves. Slug pellets, some are organic, and picking them off by hand are the key solutions. Once a magnolia gets past five years they should be able to grow through a slug attack. Rabbits can be attracted to the bark and once they find it they can easily eat through large amounts with sometimes fatal consequences. Barrier protection, either spiral tubes round the lower stems or a low level wire mesh fencing, is the only method of preventing damage. If the leaves of your magnolia turn a pale yellow colour the most likely cause is a soil which is too alkaline. This prevents the plant taking up essential nutrients. Feed the plant with a fertiliser designed for ericaceous plants (rhododendrons, azaleas etc.). Mulch around the plant annually with an ericaceous compost. Magnolias are rather expensive shrubs to buy and it can pay to be aware of where good quality plants can be bought. Our comparison below is based on plants growing in average conditions. Overall we recommend Crocus as online supplier of Magnolias. 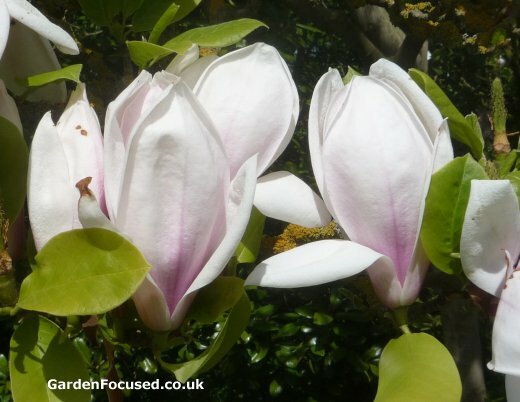 Choosing a particular variety of magnolia for your garden is of course a matter of personal preference but the list below will help identify commonly available varieties which will grow well in your garden. 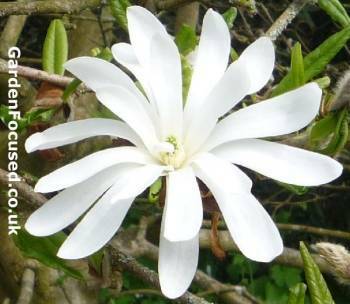 BUY ONLINE: The GardenFocused recommended supplier of Magnolia Stellata can be found here. FEATURES: Slightly later flowering than average so good for frost prone areas, size makes it a small tree, a magnificent display in spring. 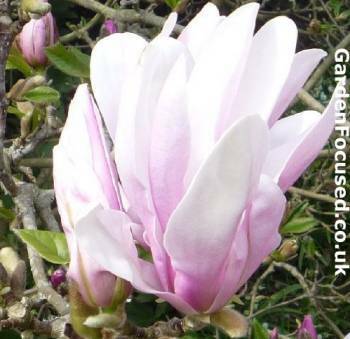 BUY ONLINE: The GardenFocused recommended supplier of Magnolia Susan can be found here. Below we list the key strengths and weaknesses of Magnolias.